A natural gas processing plant is a facility designed to “clean” raw natural gas by separating impurities and various non-methane hydrocarbons and fluids to produce what is known as 'pipeline quality' dry natural gas. A gas processing plant is also used to recover natural gas liquids (condensate, natural gasoline and liquefied petroleum gas) and sometimes other substances such as sulfur. Natural gas, as it is used by consumers, is much different from the natural gas that is brought from underground up to the wellhead. Natural gas used by consumers is composed almost entirely of methane. Major transportation pipelines usually impose restrictions on the make-up of the natural gas that is allowed into the pipeline. Natural gas must be processed to produce 'pipeline quality' dry natural gas. Some field processing can be accomplished at or near the wellhead; however, the complete processing of natural gas takes place at a processing plant, usually located in a natural gas producing region. From the wellhead, natural gas is transported to processing plants through a network of small-diameter, low-pressure gathering pipelines. A complex gathering system can consist of thousands of miles of pipes, interconnecting the processing plant to upwards of 100 wells in the area. The Pipeline and Hazardous Materials Safety Administration (PHMSA) statistics show that there were approximately 24,300 miles of onshore and offshore gas gathering pipeline in the U. S. in 2004. Processing: How Does it Work? In addition to those four processes above, heaters and scrubbers are installed, usually at or near the wellhead. The scrubbers serve primarily to remove sand and other large-particle impurities. The heaters ensure that the temperature of the gas does not drop too low. With natural gas that contains even low quantities of water, natural gas hydrates have a tendency to form when temperatures drop. These hydrates are solid or semi-solid compounds, resembling ice like crystals. Should these hydrates accumulate, they can impede the passage of natural gas through valves and gathering systems. After processing, the pipeline quality natural gas is injected into gas transmission pipelines and transported to the end users. This often involves transportation of the gas over hundreds of miles, as the location of gas production is generally not the location where the gas is used. 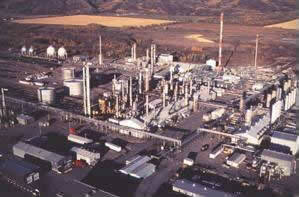 Natural Gas Processing Plants: Where can I learn more?